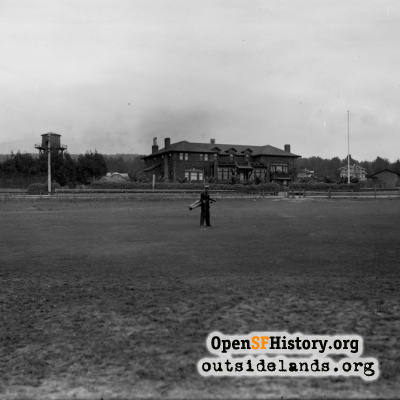 On the site of a golf course and cabbage fields, Stonestown opened as the United States' fourth largest apartment complex/shopping center. 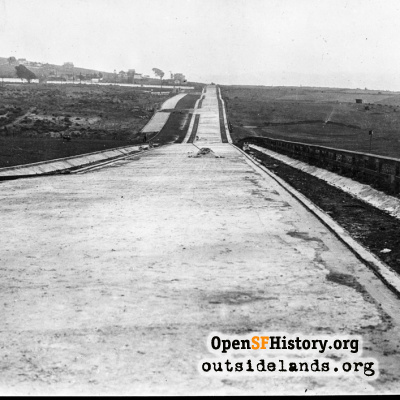 Constructed: 1949–1952, between 19th Avenue and Buckingham Way, Eucalyptus Drive, and Winston Drive, adjoining Lake Merced and San Francisco State University. 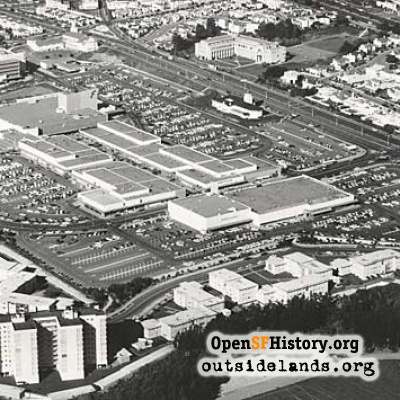 Built on the site of former cabbage fields, Stonestown opened as the United States' fourth largest apartment complex/shopping center. 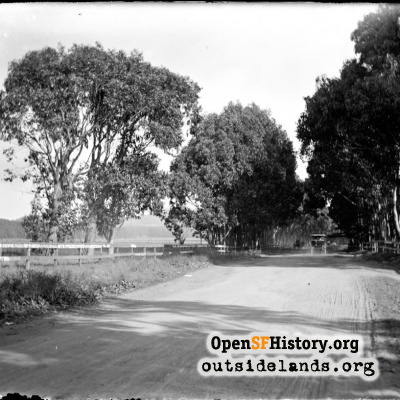 The developers, the Stoneson brothers, had long negotiations with the city of San Francisco and future neighbor San Francisco State University to secure the land and begin construction. 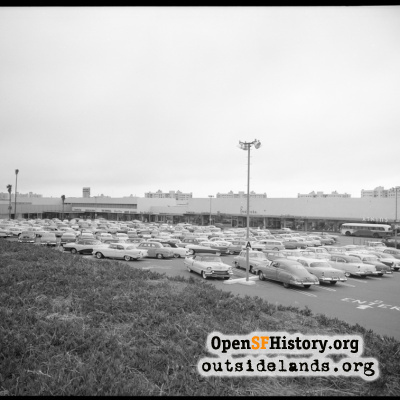 The first major tenant, the Emporium department store (who can forget the big "E" visible from 19th Avenue? 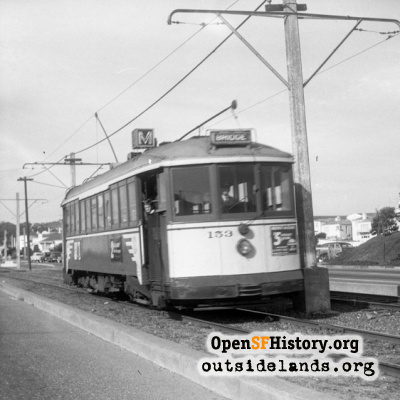 ), opened on July 16, 1952. 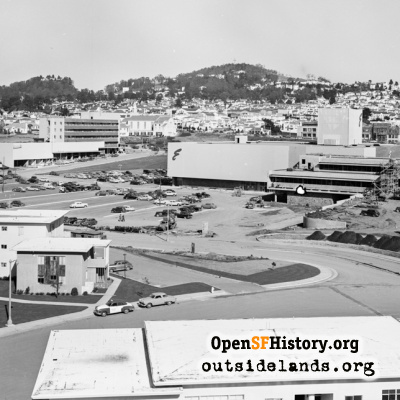 Other early businesses included Walgreens Drugs, Butler Brothers, Gallenkamp Shoes, the Red Chimney restaurant, and F.W. Woolworth's. 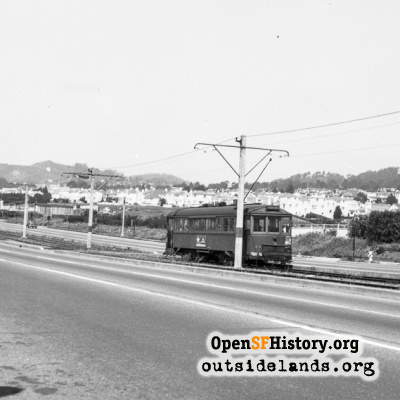 Stonestown also featured a grocery store, a well-remembered bakery, apartment buildings, and later, movie theaters. The Stonesons did an excellent job promoting the open-air mall with celebrity ribbon-cuttings, parades, and fairs. 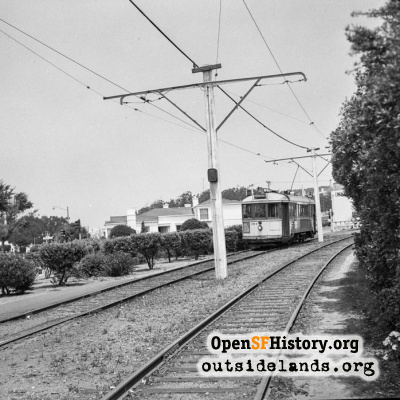 Today, palm trees lining the San Francisco waterfront are a common sight, but the Stonesons were pioneers in using them on a large scale back in 1952. 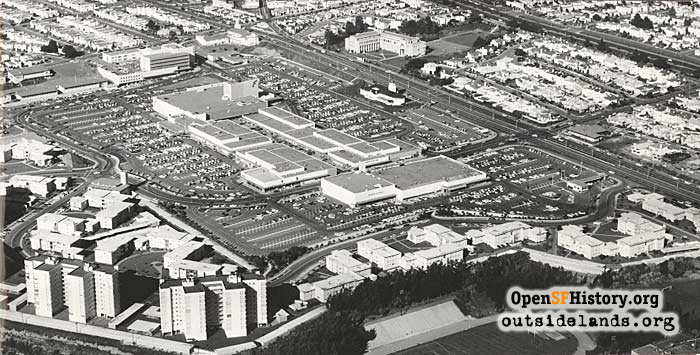 In the early 1980s, the mall still retained a classic 1950s look, but changes were on the way. 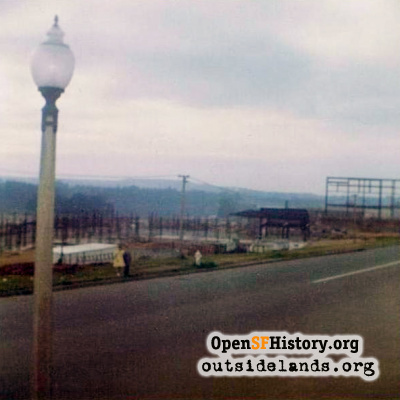 Architect John Field designed a major renovation, creating "Stonestown Galleria." He added a second level of stores, a center atrium of glass, and marble floors. 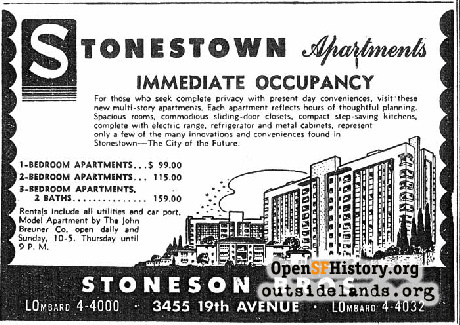 Almost all of the early tenants are gone, replaced by businesses found in malls across America, but Stonestown still thrives. 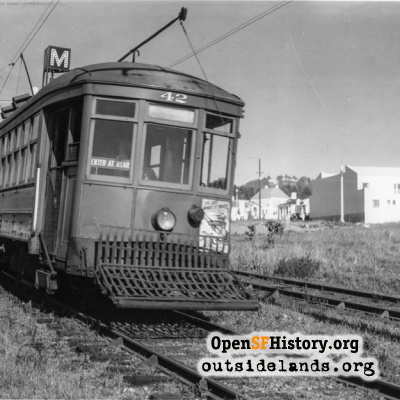 San Francisco News, July 2, 1949: "A small city is rapidly springing up west of 19th-av, on the shores of Lake Merced. 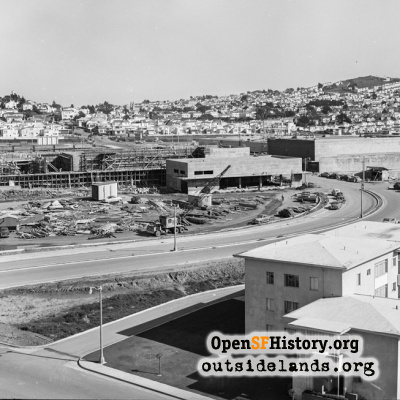 It's 'Stonestown,' 23-million-dollar project of Ellis and Henry Stoneson, and this photo shows the rapid progress being made on the four 10-story apartment houses (in the rear) and the smaller two- and three-story buildings in the foreground. Company spokesmen say the smaller buildings will be ready for occupancy about Aug. 1, while it will be another six months before the apartment houses are completed. Work on a complete shopping and recreational area will begin soon. The project will consist of 28 smaller apartment houses, the four large ones, each with 90 apartments, and an extensive shopping center. 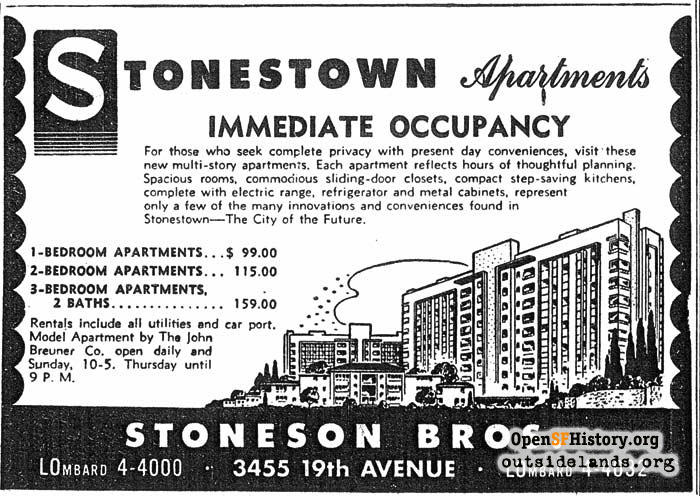 Between 3000 and 3500 persons will live in 'Stonestown' in the 783 rental units. The project covers 67 choice acres. 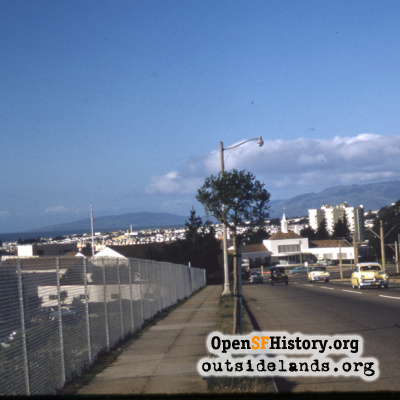 The picture was taken from Vernon and Shields-sts, a hill just east of the project." 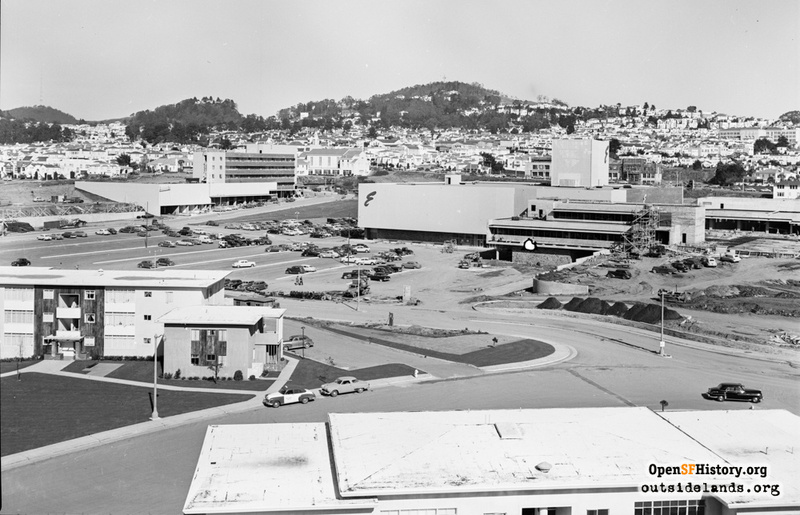 San Francisco News, February 7, 1951: "Construction on the new Emporium department store branch at Stonestown in the Lake Merced area is progressing rapidly and the opening date for the six-million-dollar, three-level structure has been tentatively set for autumn. 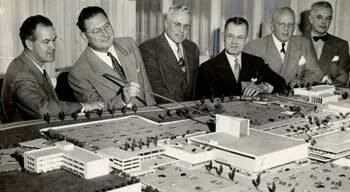 Shown looking at a model of the new 'Big E' (in foreground) and other portions of the Stonestown Shopping Center are (left to right) Welton Becket, architect, who designed the entire center; Robert Mason, who will be the manager of the modern store; Ellis Stoneson, the project builder; E. C. Lipman, president of The Emporium-Capwell Co., and Henry Stoneson, cobuilder. Man at right is not identified.". 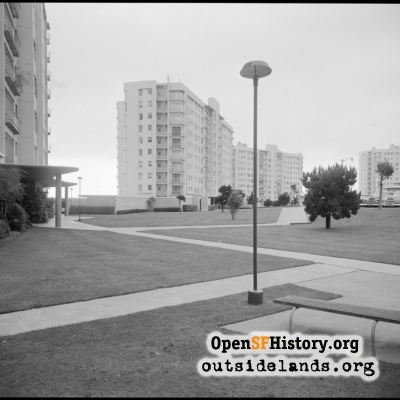 Read Virginia Southas' memories of growing up in the Stonestown apartments. 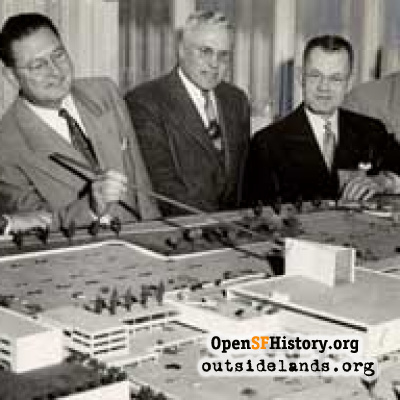 Images: 1) Construction of Stonestown apartment buildings, San Francisco News, July 2, 1949 (Courtesy of the San Francisco History Center, San Francisco Public Library); 2) Welton Becket, Robert Mason, Ellis Stoneson, E. C. Lipman, Henry Stoneson and an unidentified man looking at a model of Stonestown Shopping Center, San Francisco News, February 7, 1951, (Courtesy of the San Francisco History Center, San Francisco Public Library). 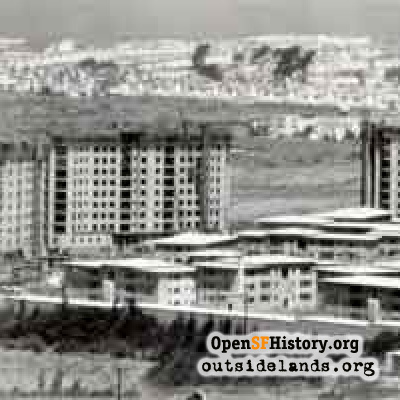 Sources: 1) OMI Founders' Days Celebration, 1998; 2) Architect and Engineer, July 1950; 3) San Francisco News, October 17, 1952. Page launched 8 August 2002; updated 31 October 2005.